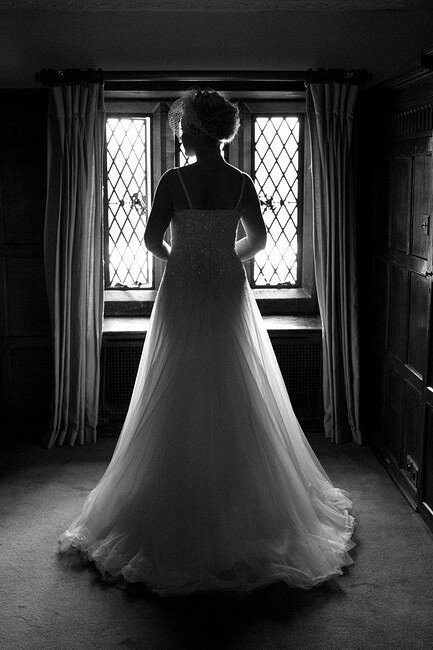 As recommended suppliers, wedding photography at Great Fosters is always a pleasure. This time – unusually on a Monday – we were photographing Nahid and Andrew’s big day. After first dropping by Nahid’s parents’ house in Hounslow, we arrived ahead of the ceremony in the Orangery to grab some photographs in the gardens with Andrew and his groomsmen. We stayed through until the first dances in the 14th century tithe barn – and finished the coverage with a final night photograph of the couple in front of the nicely-lit hotel. Great Fosters is an historic, grade one listed building set in beautiful parkland and gardens near Egham in Surrey (it says on the venue’s website that it was originally built as a royal hunting lodge in 1550 AD). The venue describes itself as a romantic, luxury hotel – and it is hard to disagree with that description. Certainly, as Great Fosters wedding photographers, we never get tired of the venue, simply because there are so many varied photographic opportunities, both inside and out. This time, one of our favourite photographs is on the staircase. It requires a good, wide angle lens in a tight position; and the contrast from the window through to the dark panelled wood is very strong. But the final outcome offers an artistic and romantic feel to the image. We also really like the emphasis the image gives to the bride’s dress. 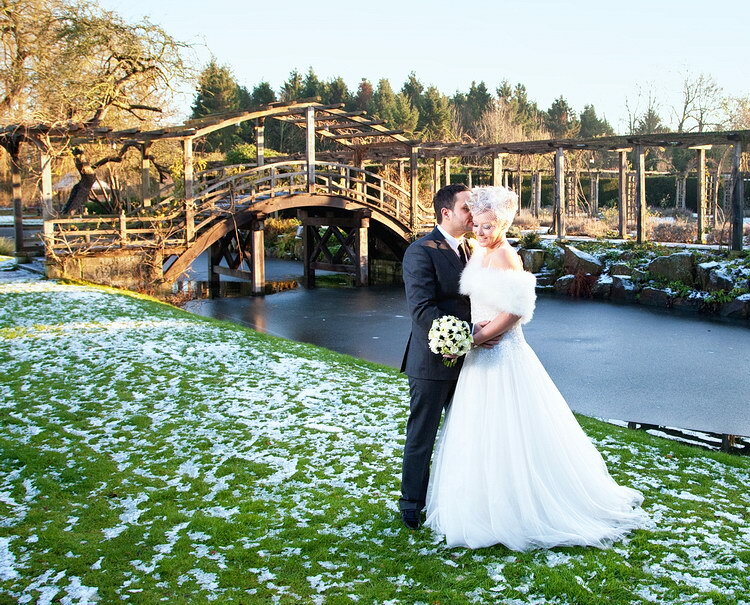 In addition to the pretty rose garden and bridge, the fountain also offers a natural draw to wedding photographers. Image 9 in the gallery uses off-camera flash to pull out a little drama; and also allows the image to capture the detail in the bright sky and water alongside the darker foreground. 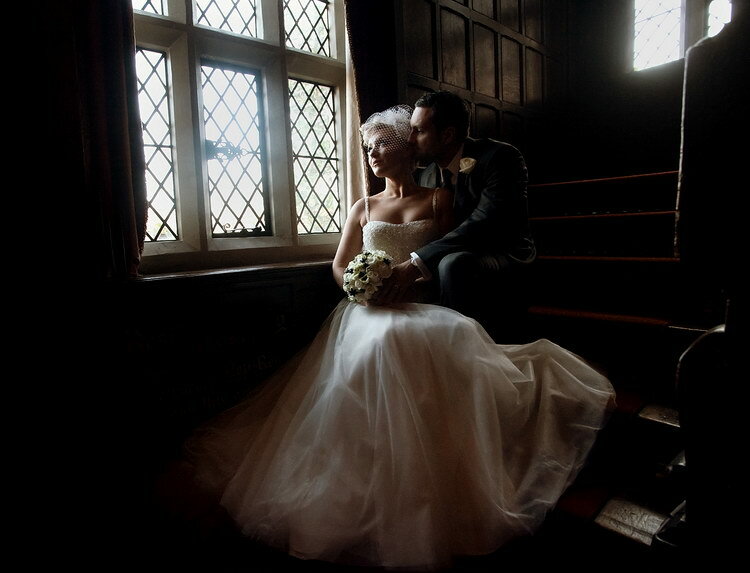 More details about wedding photography at Great Fosters and the venue itself can be found on their website here. The flowers for the wedding were supplied by The Fine Flowers Company. Chloe and Kieren at Great Fosters – Surrey Wedding Photography. 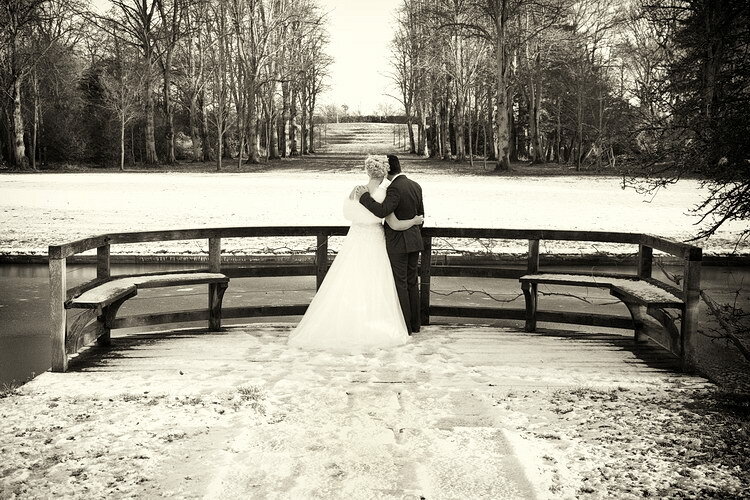 Conditions couldn’t have been better for our December wedding at Great Fosters on the 22nd: snow, sun, stunning bride, fantastic venue and a great couple to photograph! The wedding had a really lovely festive atmosphere. 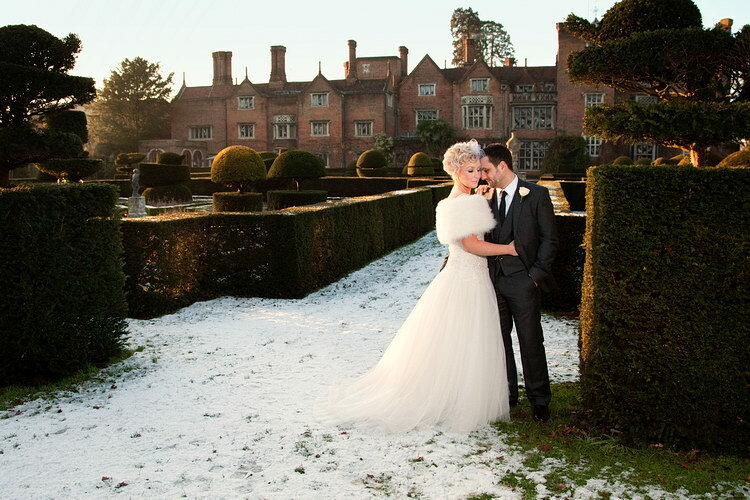 We have now agreed to be one of the recommended photographers at Great Fosters. To see more of our work at Great Fosters, click here.